Even before my visit to Chicago, I had heard so much about the great Spanish cuisine in the city. And after personally visiting the city, I can definitely see why. During a lunch time visit to Cafe Ba Ba Reeba (@cafebabareeba), I had the pleasure of tasting some dishes from their Spanish tapas menu, crafted by Chef Tim Cottini. If you're not interested in ordering small plates, they have regular lunch and dinner menus that offer classic Spanish entrees. Regardless of what you settle on ordering, you can be assured your meal is as close to Spanish roots as it gets: the charcuterie, cheese, olive oil, rice and spices are imported directly from Spain! During my Easter weekend in Chicago, I had the pleasure of staying at The Wit hotel, right in the heart of Chicago's theater and business district. Beautiful rooms, friendly staff, and delicious cookies at the check in desk whenever you crave them! Anyway, the State and Lake Chicago Tavern is the restaurant located in The Wit hotel (@theWitChicago), and serves up pub and bistro inspired food. To maximize our time experiencing the city, my friends and I ended up eating breakfast here one morning. A couple of weeks ago I went to the windy city of Chicago for the first time, and I must say I was pretty excited. Not only have I heard so much about the city itself, it meant that I could finally try the infamous Chicago deep dish pizza. And I did not waste time to cross that off the to-do list. The very first night we touched ground in Chicago, we headed to Giordano's Restaurant & Pizzeria (@GiordanosPizza) to give deep dish pizza a try! There were a couple other popular places that those more familiar with the city recommended for deep dish pizza (Lou Malnati's Pizzeria, Gino's East) but the general consensus seemed to favour Giordano's the most. The story of Giordano's starts with two brothers Efren & Joseph Boglioren, who arrived in America during 1967 and found that the pizza being served was no where comparable to what their mother, Giordano could made back home in Italy. Determined to rectify this, they opened the very first Giordano's Restaurant & Pizzeria in 1974, to try to bring the best pizza to the city. Since then, there are 40 Giordano's locations in Illinois and Florida, with 14 of them being in Chicago. And the last chapter of my first food crawl with Andrew (@_aneb), Justine (@foodigatorJ), and Chieu (@chieunghi) takes place at a small sandwich shop in the Trinity Bellwoods neighbourhood. Porchetta and Co (@PorchettaAndCo) serves exactly what you think it does: porchetta. And that's pronounced "porketta" as Andrew would emphasize. The recipe for this traditional Italian pork roast at Porchetta and Co starts off with a 24 hour marinated pork shoulder. It's wrap it in prosciutto, then again wrap in cured pork belly, and roasted until crispy on the outside. This masterpiece is finally carved to be placed on sour dough buns. Sound amazing? Well it kind of is, so keep reading. 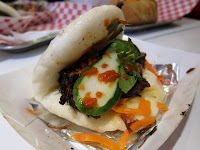 Continuing on my first food crawl with Andrew (@_aneb), Justine (@foodigatorJ), and Chieu (@chieunghi), we ventured to Banh Mi Boys (@banhmiboys), after having stuffed our faces at El Trompo Taco Bar. Last week I went on my very first food crawl with Andrew (@_aneb), Justine (@foodigatorJ), and Chieu (@chieunghi). I didn't know what to expect, but I made sure I showed up with a hungry appetite and a comfortable pair of shoes. Good thing, because I definitely needed both of those that night! El Trompo Taco Bar was the first location we hit up. Located in the kensington area, you really can't help have a glance at it as you walk by. It's painted completely bright red, with a starkly contrasting yellow sign. Somewhat of ann eye sore, and adorable at the same time.